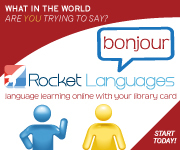 Rocket Languages – An award winning interactive online language learning system allows patrons to learn conversational languages (15) at their own pace. The free program allows downloading for easy access at the user’s convenience. 90+ hrs of interactive instruction, with speech comparison, self-testing, and word games. Patrons can track their progress and downloads do not expire. ArtistWorks for Libraries – Music & art lessons through free, self-paced videos taught by professionals. ArtistWorks offers 24 instruments (guitar, piano, violin, banjo, percussion, jazz), voice, and fine-arts classes, from basic to advanced courses. Patrons can track their progress and downloads do not expire.